To be perfectly honest, I am not a 100% sure this guy was a Pintail, more like 90% sure. We shot several Pintail ducks during a hunt this season. We hunted in a flooded marsh next to large rice fields and almost all of the ducks, including the Pintails, where covered in a thin layer of lovely white fat. According to Hank Shaw and his wonderful new book Duck, Duck Goose “Pins” make for fantastic eating and those covered in white (not yellow or orange) fat are almost guaranteed to be delicious. He is right on both counts. The inspiration for the flavor of this recipe is a famous dish from the Manhattan restaurant Eleven Madison Park. Chef Humm from EMP serves a fantastic roasted duck, served whole and then carved table-side. I’ve never had the dish but I’ve been pining to try it out ever since I saw it online a while back (just Google Eleven Madison Park duck). The bird is coated with lavender, honey and spices and then roasted in a hot oven until golden brown and crackly. This seemed like a great way to try on my Pintail using the Hank Shaw method of roasting a whole small duck in a hot oven. I patted the duck dry well salted it and let it rest in the fridge for a few hours. Before cooking, I dried it well again and coated it with honey then sprinkled it with a mixture of toasted and coarsely crushed coriander seeds, fennel seeds, cumin seeds and salt. 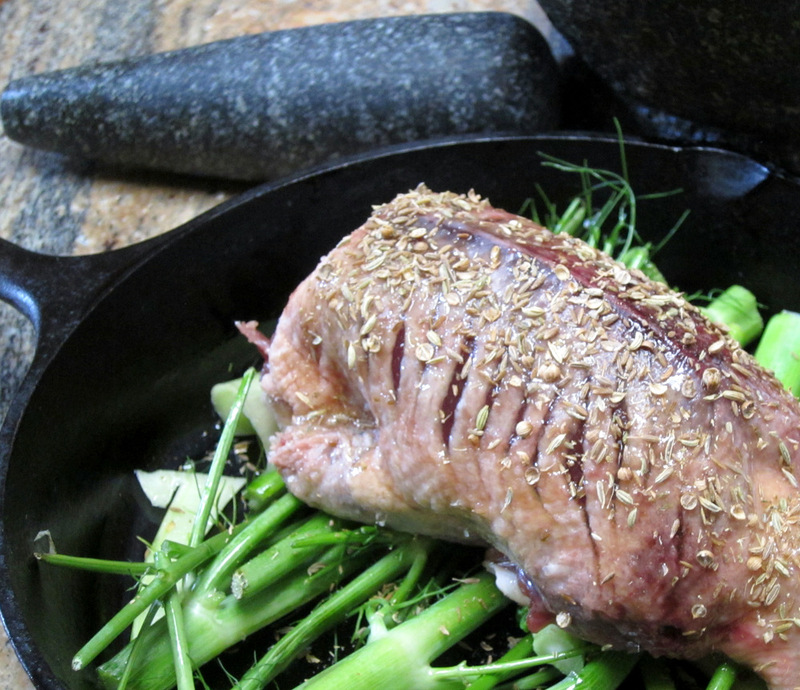 I put the duck on a few branches of fennel in a cast iron pan and then baked it in a very hot oven (about 500 F) until the breasts registered 135 F on a meat thermometer. Following Hank Shaw’s method, I carved the breasts off the bird at that point and let them rest on more pieces of fennel. The rest of the duck went back in the oven at a lower temperature so the legs can finish cooking completely and tenderize a bit. Right when the legs are cooked, I returned the breasts to a hot pan, skin side down to crisp them up really well without overcooking. The cooking method worked exceptionally well. I ended up with a lovely pink breast meat and tender well cooked duck legs. 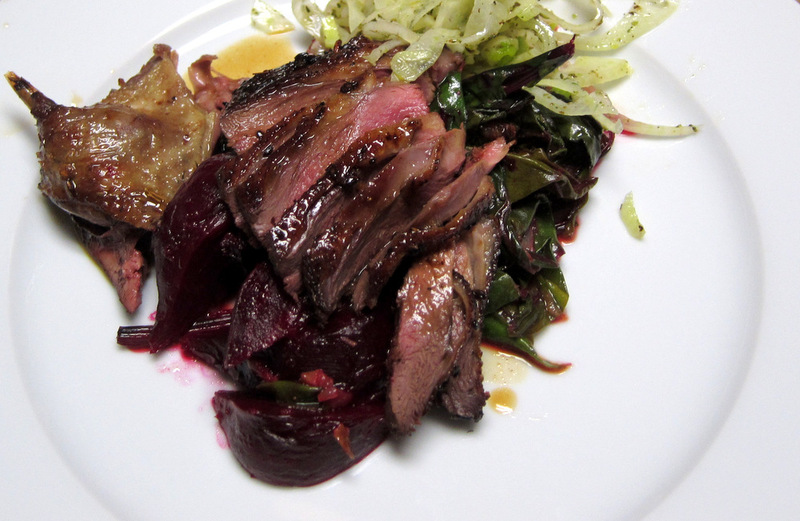 To serve I paired the bird with roasted beets -I always seem to end up with beets and duck somehow- sauteed beet greens and a fennel salad coated with a lemon dressing. I finished the dish with a pan sauce made by quickly cooking down some shallots in the fat in the roasting pan and de-glazing the whole thing with some white wine and water. I adjusted the flavor of the sauce with a little apple balsamic vinegar, mounted it with butter and drizzled over the plate. 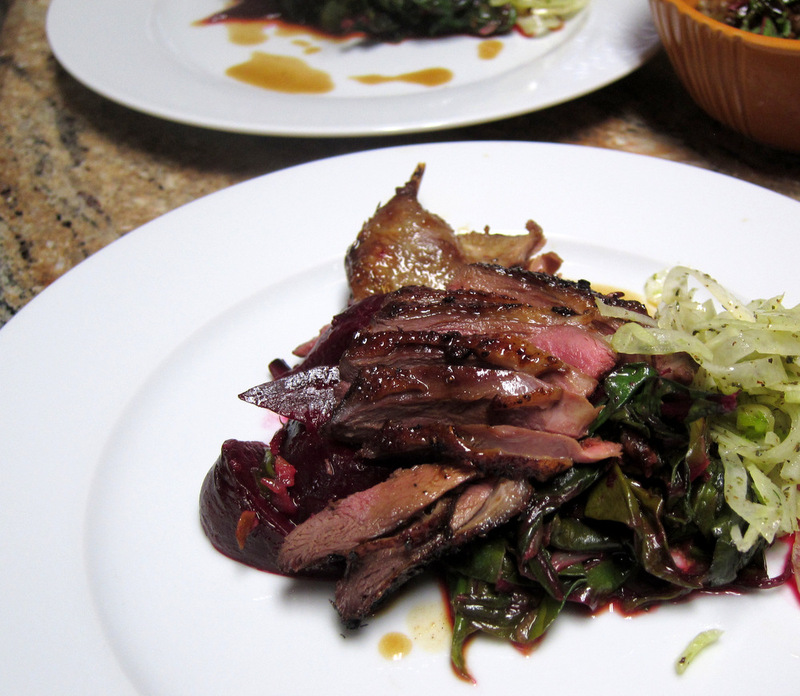 The duck was fantastic with sweet caramelized flavors, crispy skin and wonderful fragrant spices. 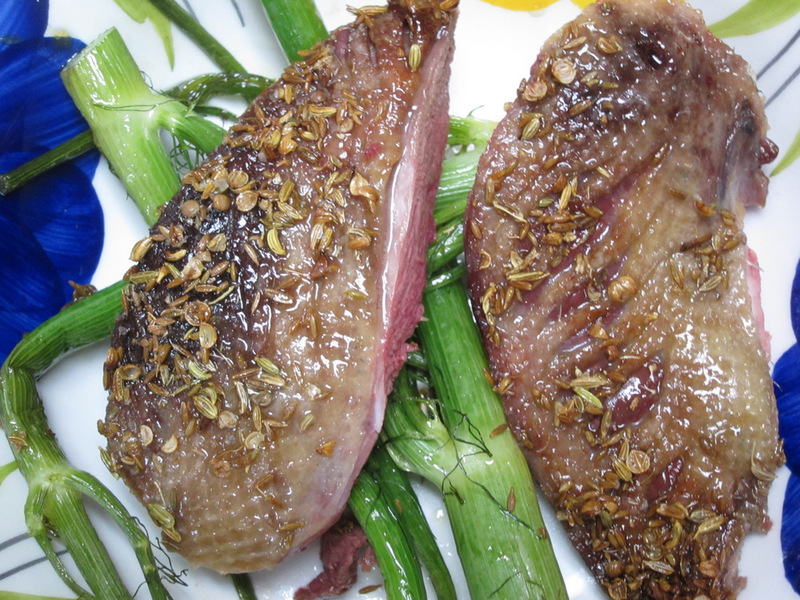 This really is the best wild duck I’ve cooked so far. 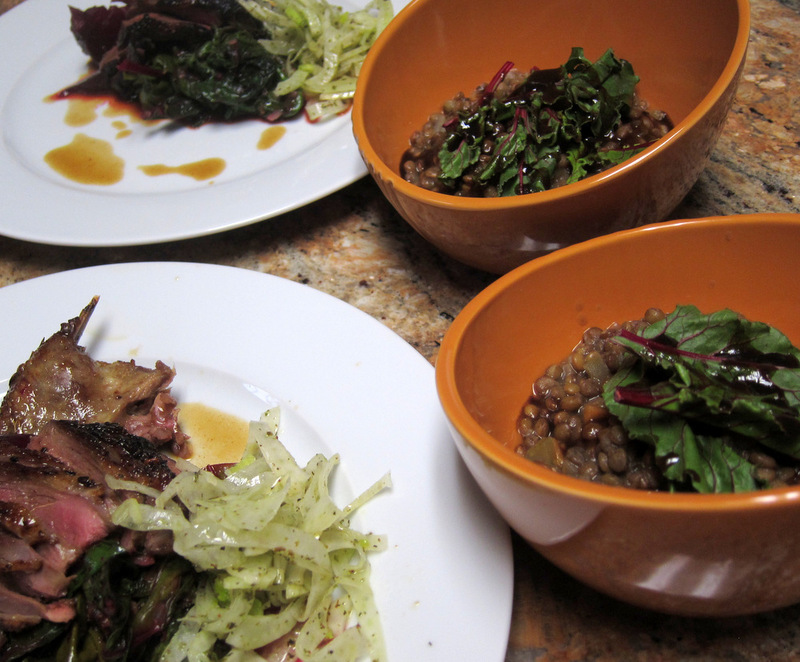 I did serve this with a simple side dish of Puy lentils. I used the smallest tenderest beet leaves raw. These got tossed with a balsamic vinaigrette and went on top of the lentils. As good as these lentils were, they really were not needed. The duck plate was satisfying and filling enough and required not extra starch. That looks deeeelicious!! Well, y’know except for the puy lentils *pulls face* You’re right puy lentils are absolutely not needed. Ever. That is very nice of you Lesley. Thanks for the visit, the positive comments and the nom! i’m with lesley.. this looks delicious!